This is a rare amplifier from Luxman and was one of the finest pieces of audio from Japan in the 1970’s. 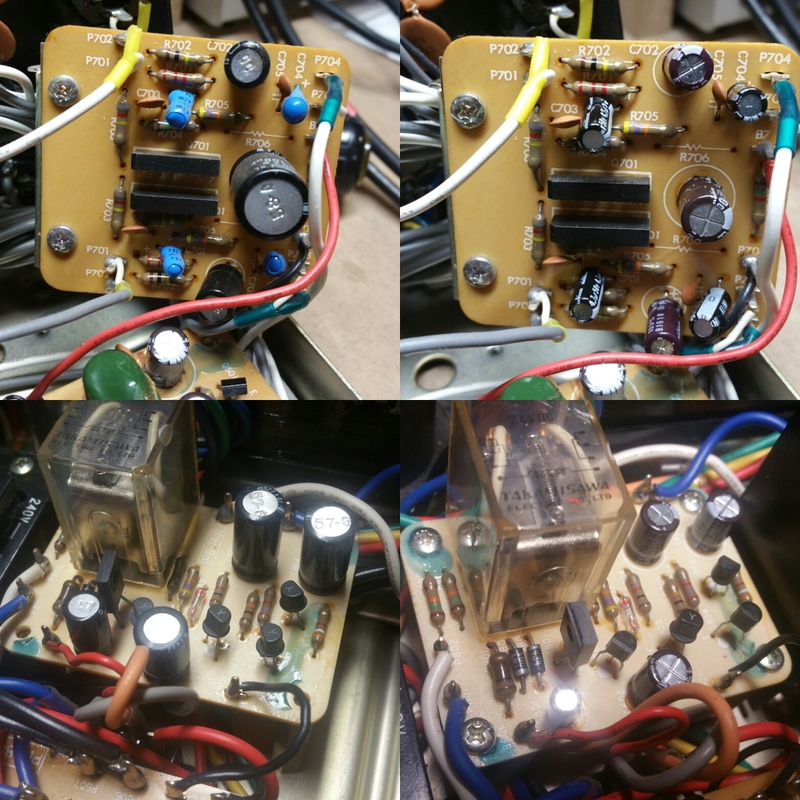 The amp is in near flawless condition but was suffering some of the issues that come with 40yr old parts. The owner was describing distortion in one channel and on arrival we noticed a delayed protection relay and often protection state activations after distortion. We started with the power supply and preamplifier which is oddly on the same board which makes up the majority of the real estate in the chassis. All new capacitors from Nichicon, using the correct series for the purpose of the capacitor in the circuit. Caps in the signal path were changed to low noise electrolytic or Wima film caps, removing all the tantalum capacitors. C1345 and A640 transistors which are common for failure were replaced with their modern Fairchild equivalent matched pairs. 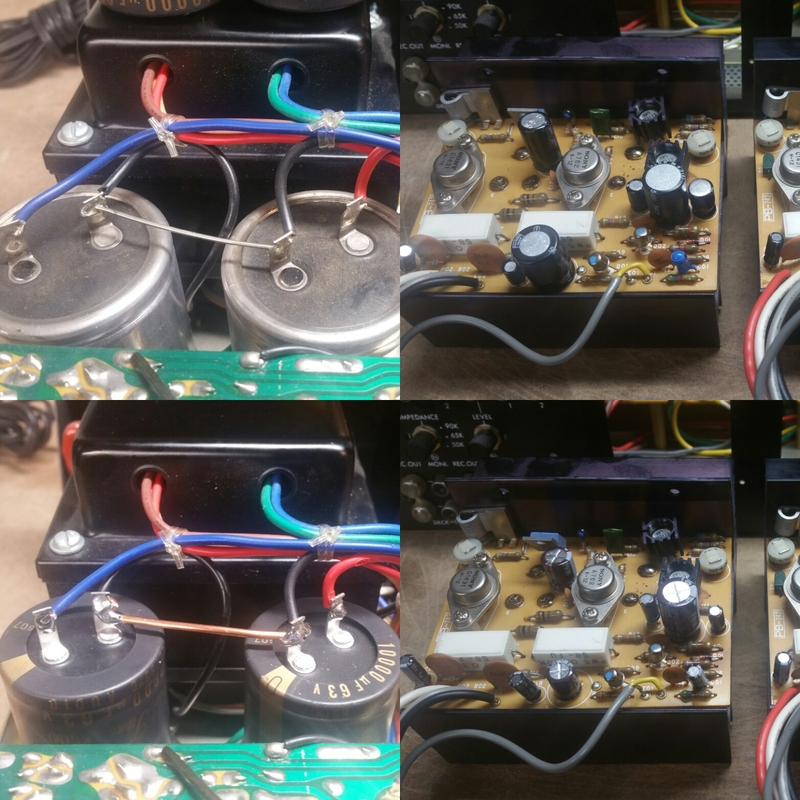 Next we tackled the protection circuit and the main amplifier filter capacitors. The drive transistors for the relay were replaced and the filter caps replaced with beautiful Nichicon “Gold Tune” series caps. The phono board was rebuilt with new caps also replacing the pesky tantalums. 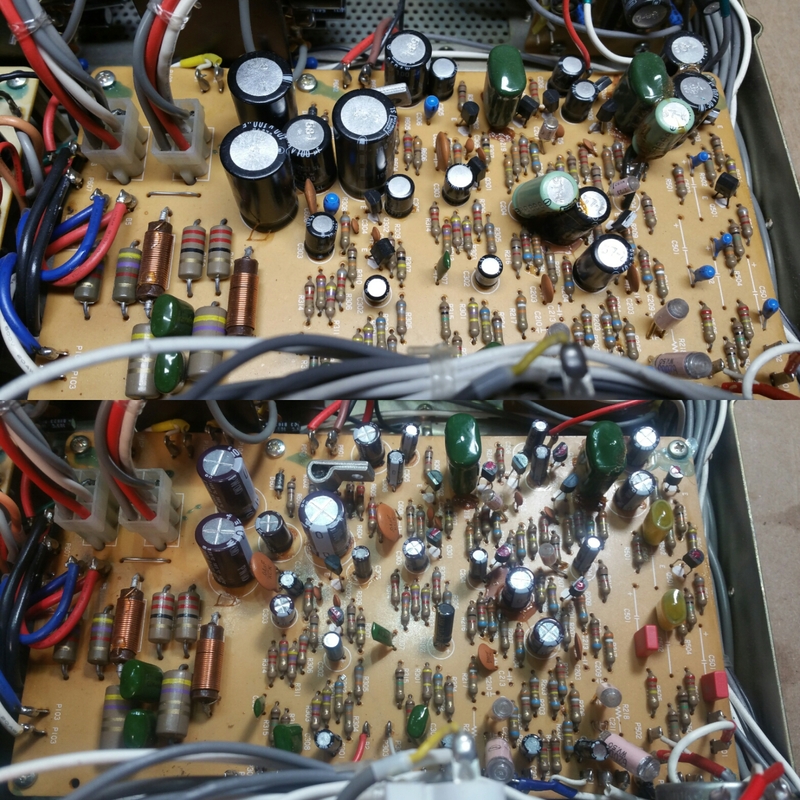 Lastly, the amplifier was rebuilt with new capacitors. 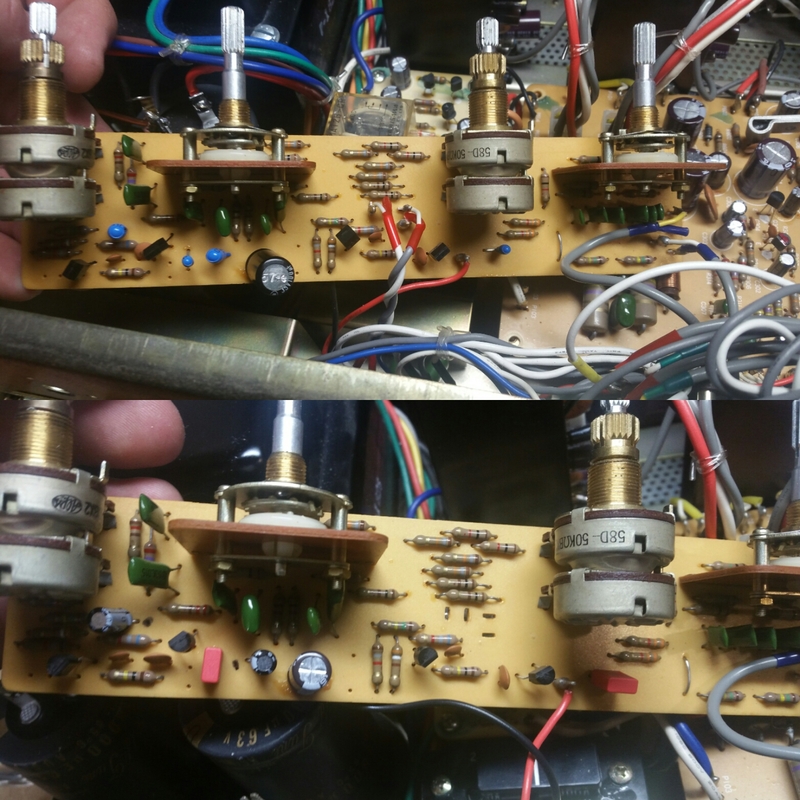 The tone board behind the faceplate was pulled to clean the controls, replace capacitors, and transistors. We discovered an issue with the left amplifier spontaneous driving the amp into protection from a large DC current being produced. This issue would come and go but was difficult to replicate or diagnose. Finally, we discovered diode D02 was the culprit leaking backwards and producing a 35v potential on the nearby transistors base. We replaced the diode accordingly and the issue resolved. We then replaced the same diode on the other amplifier for completeness. 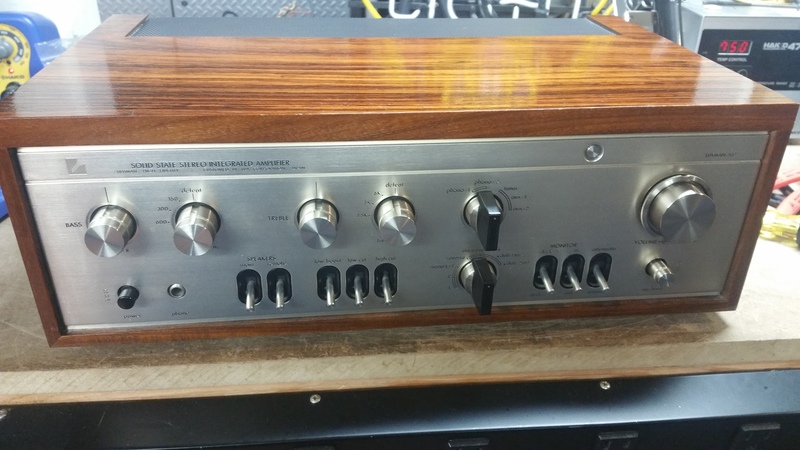 The amplifier was aligned and this amp within a half hour following the recap opened up and showed us why it is such a highly respected piece of high fidelity equipment.